Make your heart b(l)oom and explore Holland by bike with Verita's Visit Holland. Born on a bicycle and raised in Delft (NL) I love the Dutch countryside. With Verita's Visit Holland I organise bike tours & team events. I take you on and off the beaten track to meet tulip growers, cheese farmers and lords of castles. My specialisation: Keukenhof area, Cheese farm region and Delft countryside. Just send me an e-mail at veritasvisit(@)gmail.com to get more info. Where do you park your bike at The Hague Central Station? This was the question I asked locals and expats in The Hague after another frustrating search for a bike parking spot at the station. With their answers and my own Sherlock Holmes senses I took up this bike-related challenge. I started this investigation with only one goal: to find the best free bike parking The Hague Central Station for you and me. The other day I raced to the central station. I had about 10 minutes to park my bike and catch the train. If you regularly take the bike to the station you know this is little time to find a place. Finding a proper parking spot is time-consuming and frustrating. Especially at the front side of the station, the Koningin Julianaplein. The bike parking The Hague station at the KJ plein is simply a nightmare. The bike parking racks are always crammed and bicycles often come out damaged. This parking is an incredible popular place to put the bike, because it’s free and easily reachable. In a hurry, you can quickly drop your bike and run to catch the train. Although it’s not allowed, you’ll find many bicycles parked outside of the bicycle racks. If you did park your bike outside of the racks and can’t find it on your return, check the bicycle depot of the municipality. Before they take the bike, it will get a tag saying you parked it in an illegal spot. The bike parking at the front side of the The Hague central station is a temporary solution. The The Hague municipality will start the construction of a new underground bike parking at the KJ plein Mid- September 2016. The parking facility will have space for 10.000 bicycles. I’ll keep you posted. The Rijnstraat bike parking is a temporary construction made in 2013. The multi-storied cycle flat is adjacent to platform 1 of the trainstation. With direct access to the bus platform and tram stops, it’s an ideal location to put your bike when using these modes of public transport. 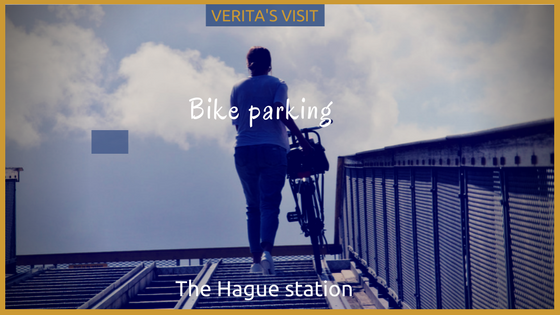 There are more than enough spaces left in the two-level bike racks and many locals and expats in The Hague make use of this parking facilities. The only downpoint could be the climb to the first or second floor which does demand a good technique with bike brakes. When the other bike parkings The Hague station are done, the Rijnstraat bike parking will be removed.Along platform 1 is another, smaller parking facility for your bike. It’s right at the end of the taxi stand and offers direct access to the platform. Stairs lead to a bridge which gives access to other platforms. Are you living in Bezuidenhout or surroundings? Then you most probably park your bike on the Royal Library side of the station. Finding a parking spot next to the Royal Library and behind the Ministry of Foreign Affairs is slightly less difficult than on the Koningin Julianaplein, but still a challenge. You’ll have better chances at the Grotiusplaats, which looks out on the Gipsen store on one side and the Royal Library on the other. Around the corner is a new indoor bike parking The Hague station where you can keep your bike free and safe. All the bike parkings mentioned so far are free, but unguarded. One of the The Hague locals referred to the opening of a new free guarded and fully covered bike parking at the Anna van Buerenstraat. I thought it wouldn’t be to difficult to find it, but it was. Signs on the ground indicate the way to this recently opened parking facility, but they’re easy to overlook. The Anna van Buerenstraat is right next to train platform 12 where construction is still taking place. The bike parking The Hague station, located at the end of the street is a bit hidden from view. It can’t be seen from the Anna van Buerenplein, the hip and futuristic styled square that connects the Leiden University building, New Babylon and the The Hague Central Station. The new parking facility offers space to 1.100 bicycles, but for now only a handful of bikes are stationed there. It’s a beautiful modern space, with a built-in electronical system. This monitors how long your bike is in the bike parking The Hague station and which spaces are available. Red and green light indicate the free spaces. Unlike many other guarded parking facilities in The Hague no tickets are used here to register the coming and going of the bicycles. You can park here up to a maximum of three weeks. The Anna van Buerenstraat bike parking opens 15 minutes before the first train and closes 15 minutes after the last train. For me, this bike parking facility is the winner of bike parkings around The Hague Central Station. A large clean and covered parking with lots of space to park your bike, close to the entrance of the station’s main hall and with friendly guards taking care of your bike while you’re away. Do you have a bike-related challenge for me? Leave a comment, post it on Verita’s Visit’s Facebookpage or send an e-mail to veritasvisit @gmail.com. What’s the name of Keukenhof area?